Minyon Moore, a top adviser in her failed 2008 presidential run and current 2016 campaign, compiled a list of tweets and positive news articles and emailed it to Clinton Chief of Staff Cheryl Mills under the subject line "She’ll need these when she comes out of there … she did great under the circumstances." 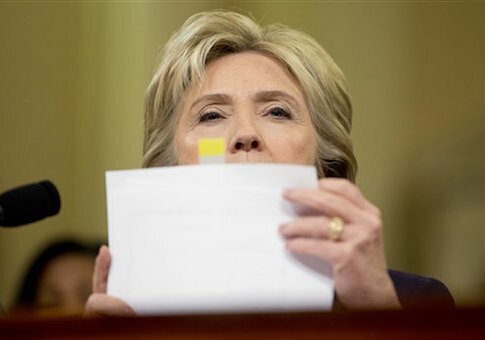 The email featured links to a BuzzFeed listicle of various pictures of Clinton with quips about her gesticulations, an Associated Press article praising her "feisty" demeanor, a Huffington Post caption contest declaring that "Hillary Clinton not impressed with the questions during #Benghazi hearing," and a Time write-up titled "Clinton on Benghazi: Tears and Anger." Moore also highlighted 33 tweets from news organizations and fans such as @Lee78043. "Rep Duncan isn’t fit to speak #HillaryClinton’s name. Another USELESS #GOP blowhard," Mr. 78043 tweeted. The account has since been deleted. @Doodledevotee, a self-described "fan of dogs and underdogs, fairness and justice, progressive causes and Middle class values" with 40 followers and an egg profile picture, also caught Moore’s eye. "How does it help the unpopular Congressional #GOP to attack the popular #HillaryClinton in these Benghazi hearings," Devotee said. Mills was impressed with the list, forwarding it to a junior State Department staffer with orders to "pls print for her," a task that required 63 pages of taxpayer-funded paper. The email was one of several thousand messages recovered from Clinton’s private server and released by the State Department on Nov. 30. Moore was not the only Clinton loyalist to comb through Twitter so Clinton would only be exposed to nice things after her testimony. That same day Strobe Talbott, a foreign policy researcher at the Qatar-funded Brookings Institution, also sent over nine tweets about her performance, including MSNBC anchor Andrea Mitchell’s observation that "Clinton not taking any guff from these guys #mitchellreports" and Colby College Assistant Prof. Laura Seay’s disclosure that "I’m a little in awe." Clinton forwarded the email to an aide two days later to "Pls print," a task that required two pieces of taxpayer-funded paper. Talbott also shared a post from his Brookings colleague and Washington Post contributor Dan Drezner. "Conspiracy-mongers are gonna go nuts after Clinton’s testimony today. For someone with serious health scares last month, she looks fabulous," Drezner wrote. Clinton recovered from those health scares with help from concerned friends. In December 2012 Clinton suffered a concussion after falling, which forced her to postpone the Benghazi hearing. On Dec. 30 State Department spokesman Phillippe Reines revealed that Clinton was hospitalized with a blood clot. Margaret Williams, who was Clinton’s campaign manager in 2008 after serving as President Clinton’s chief of staff at the Clinton Foundation, emailed her Shel Silverstein’s poem Sick, which details the health problems of one Peggy Ann Mckay. "Here’s hoping you and Peggy Ann McKay (referenced below) do not share any of the same ailments. Yes, another poem. (And get the hell out of that hospital soon.) Love M," she said. Clinton forwarded the poem to a staffer on Jan. 10 with instructions to "Pls print," a task that required two pieces of taxpayer-funded paper. While Clinton was recovering from her health scares, her staffers hoped to improve her spirits by drawing attention to her popularity among everyday Americans. On Jan. 8 State Department adviser on women’s issues Rachel Vogelstein circulated a tweet from Sandra Fluke, a Georgetown Law student who would later make a failed run for California State Senate, to other members of Clinton’s team. "Sandra Fluke (young contraception advocate) just tweeted this from her twitter account last week: ‘Honored 2 meet @JohnKerry. Promises if confirmed he'll continue Sec. Clinton's focus on women & girls' empowerment as development strategy,’" the email says. Clinton responded to the message two hours later. "Pls print," she said of the single tweet, a task that required one page of taxpayer-funded paper. A Clinton spokesman did not return request for comment asking if printing out tweets was environmentally responsible or a proper use of taxpayer dollars.